Creamy White Sauce Crab Enchiladas are lightened-up enchiladas packed with flavor. 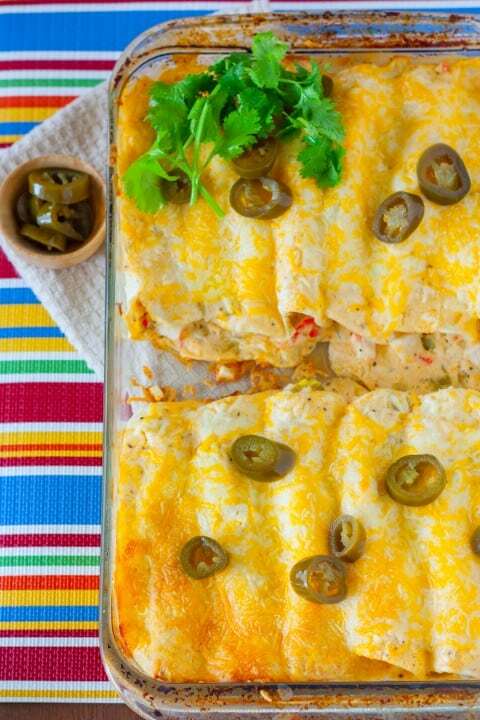 This simple meal can be prepped and baked within an hour…how’s that for easy enchiladas? I was always under the impression that making enchiladas was an all-day affair. Well, preconceived notions can now be cast aside with this time-saving recipe for Creamy White Sauce Crab Enchiladas. These require less than 20 minutes of prep. These 5 Ingredient Slow Cooker Carnitas Enchiladas are also made simple and loaded with flavor. 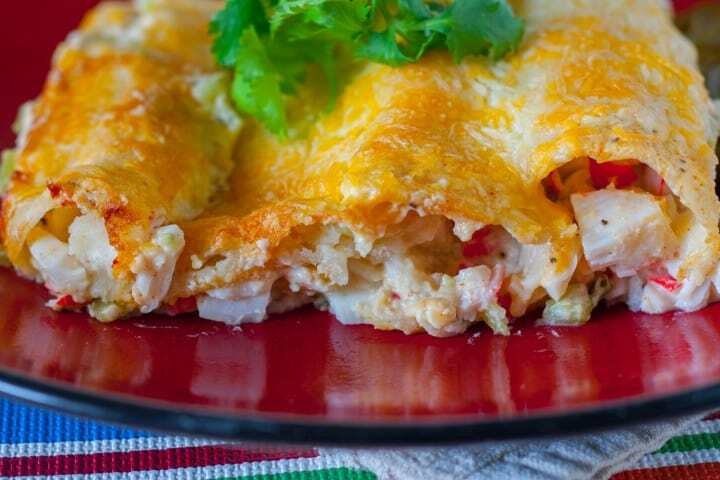 This crab enchilada recipe consists of mainly household staple ingredients, besides crab meat. You can opt for real crab meat for better flavor, however, the imitation version is fine. On that note, you can replace the crab with another seafood, such as cooked shrimp or fish. This Creamy White Sauce Crab Enchiladas recipe is flavorful and lighter than traditional enchiladas. The sauce is made up of light sour cream, yogurt, and milk, with no cream or butter. Canned green chilies add spice and tang, and are easier than roasting fresh chilies. Choose how spicy you’re feeling and use the appropriate level of canned chilies. Stir together sour cream, yogurt, flour, salt, cumin, and paprika. Stir in milk and green chilies, then divide sauce in half. Stir in chopped crab meat and green onions in one half of the sauce to make the filling. Evenly divide crab filling between corn tortillas. Roll tightly and line into a baking dish, seam down. Spoon the remaining sauce evenly over the tops of the enchiladas. Sprinkle with cheese and bake. Replace crab with tofu or other vegetables for a vegetarian option. Use light or low-fat sour cream and yogurt to make it lighter. Have leftovers? The enchiladas will store well in the fridge for 2-3 days. Quick and easy crab enchiladas with diced chilies, spices, and cheese in a creamy white sauce. Preheat oven to 350º F. To make the sauce: In a large bowl stir together sour cream, yogurt, flour, salt, cumin, and paprika. Stir in milk and green chilies. Divide sauce in half. Combine chopped crab meat and green onions in one half of the sauce to make the filling. Evenly divide filling between tortillas. Roll tightly and place in a baking dish, seam down. Spoon remaining sauce evenly over the tops of the enchiladas. Sprinkle evenly with cheese. Bake uncovered, for 35-40 minutes, until heated through and cheese is lightly browned. Let stand for 10 minutes and top with cilantro as garnish. You can also you other seafood such as shrimp, crawfish or lobster. Looks good! Have you ever frozen and then baked this? Wondering how the white sauce would freeze. Thanks Trista! I haven’t but assume it would be fine. The yogurt and cream cheese might crystallize and get slightly watery, but probably would evaporate or incorporate back into the casserole when baked. 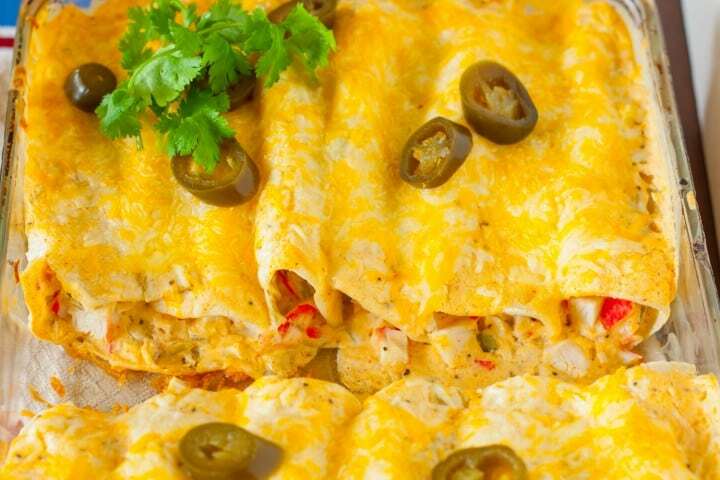 Your recipe for crab meat enchiladas sounds great. I love crab. The fact that it takes so little time to prepare is a definite plus. Thanks for posting this great recipe. Hi Analida, thanks for the compliments and I hope you enjoy the recipe. It is a very easy enchilada and very adaptable, you could used cooked chicken or shrimp as well.